Charlie was in my office yesterday. We talked about mostly nothing for a half a minute, when I suddenly became uncomfortable. Something happened inside of me, mostly with my stomach. I wasn’t in discomfort, but there was a significant twinge. The twinge in my stomach was caused by a short silence, a white space in the conversation. I asked a question about Charlie’s last meeting with his boss. There was no response from Charlie. Silence in a conversation often causes a momentary awkwardness. I don’t know where this conversation is going next? I thought I knew, but I don’t know now. I wish I knew, but I still don’t know. I hope this conversation get some direction soon, because this awful silence is killing me. BOOM. My stomach told me we were talking about something more important than the weather. My automatic (unconscious) reaction was to avoid. Do anything to make this feeling go away. The silence was awkward. The automatic (unconscious) response was simply to “talk.” Make the silence go away. If I talk, the silence will be gone, the awkwardness will be gone and I won’t feel this way. Talking would also likely steer the conversation back to a discussion of the weather. Channel the reaction. My bio-response to Charlie was a twinge in the stomach. The twinge told me that this conversation had potential to be more meaningful. I could avoid it or I could engage. Avoidance would be easy, simply talk to fill the silence, talk about anything. I could engage, and let the silence continue. I could let the silence do the heavy lifting to move this conversation to the next level. Something significant had happened between Charlie and his boss and Charlie needed to talk about it. We could have talked about sports, or we could have engaged in a meaningful discussion that had real impact on Charlie. The twinge in the stomach gives the Manager a heightened sense of intuition and the possibility to channel the reaction to a more productive outcome. Listen to the twinges, watch for white space in conversations. This entry was posted in Coaching Skills, Communication Skills and tagged coaching, communication, silence on December 3, 2018 by Tom Foster. I have to tell you, every time we get together, all she talks about is pie-charts, bar graphs and the big picture. It’s different down on the shop floor. Sometimes we get materials in from our vendors that are out of spec and we have to reject them. When we reject raw materials, sometimes our productivity goes down. And, remember the machine we were going to replace this year, but kicked it into next year’s capital budget. That machine breaks down a little more than it used to and when it does, our productivity goes down. I try to explain this stuff to Suzanne and she just keeps talking about the big picture. Don’t listen to Tony, he gets all wrapped around the detail and loses sight of the big picture. He just doesn’t understand what we are all about here. When we introduce the context of time span, we can clearly see the reason for this conflict. Tony is in a role with shorter time span decisions and problems, clearly having difficulty with the way Suzanne sees the world. Suzanne is in a role with longer time span decisions and problems, clearly having difficulty with the way Tony sees the world. The translator role (S-III) sits in between Suzanne (S-IV) and Tony (S-II), who can translate Suzanne’s big picture thinking (that is what we hired her for) into time span appropriate projects that Tony can drive on the production floor. This entry was posted in Communication Skills and tagged communication, translator role on May 2, 2018 by Tom Foster. Our Working Leadership Series kicks off Sep 9, 2016 in Fort Lauderdale. For more information follow this link – Working Leadership. I use questions to coach my team members, and they provide answers but not always the right answer. As a result, the conversation can appear like an inquisition. It’s challenging, at that time, not to revert to “telling” rather than “asking“. This entry was posted in Communication Skills and tagged communication, manager, questions on August 31, 2016 by Tom Foster. This entry was posted in Communication Skills and tagged communication, expectations, performance on August 19, 2014 by Tom Foster. “You could wear a sign,” I suggested. This entry was posted in Communication Skills and tagged control freak, manager, micro-manager on August 8, 2013 by Tom Foster. “Like I said, I will ask them about the way they see themselves in their role on the team,” responded Julia. We had been talking about her new management position. “And what if you don’t like what you hear?” I asked. This entry was posted in Communication Skills and tagged common ground, manager, team member on July 11, 2013 by Tom Foster. In your Time Span workshop, you talk about the breakdowns in communication that can occur when a manager skips a layer, for example a Stratum IV manager working with a Stratum II supervisor. How can you tell when you have a lost-in-translation issue? Communication breakdowns can occur for many reasons. 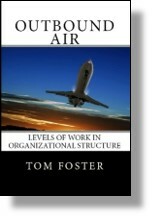 Elliott Jaques, in his Time Span research often found, that problems we attribute to communication breakdowns or personality issues, turn out to be a misalignment in organizational structure. A Stratum IV manager and a Stratum II supervisor are typically working on goals with markedly different Time Spans. Even looking at the same problem, their analysis will be different. The Stratum II supervisor may piece some of the elements together while the Stratum IV manager looks to see how this problem impacts other related systems down the road. Indeed, they may describe the problem using different words (terminology). The S-II supervisor may wonder what the S-IV manager is talking about while the S-IV manager wonders why the S-II supervisor cannot see what is altogether clear. They use different words and see the world in different ways, creating that lost-in-translation syndrome. But, your question was, how can you tell if this is Lost-in-translation? More importantly, how can we recognize the difficulty and what steps can we take to prevent it or cure it? Underperformance of any kind indicates a problem. Any time performance does not meet expectation, there are three places to immediately look. Is it a problem with the performance? Is it a defect in the expectation? Is there a problem with the communication of the expectation? If it’s a problem with the communication, then lost-in-translation could be the culprit. And the accountability lies with the manager. It is (always) the manager who I hold accountable for the output of the team member. What needs to change? What managerial behavior needs to change? I see two steps. The manager should recognize the time span framework of the team member. Here is a quick set of diagnostic questions – “What is the task? When should this task be completed?” The response from the team member is a clear indication of the Time Span the team member has in mind. This Time Span is impacting every decision surrounding this project. The adjustment for the manager is to speak in terms of the other person. The manager should examine the language (words) being used to make sure the meaning of the words is common and clear. During a task assignment, I will often ask the team member to take written notes and feed back to me their understanding of the work instruction. In there is confusion, it can generally identified in this step. It is the manager I hold accountable. The manager is 100 percent responsible for the communication in this lost-in-translation issue. This entry was posted in Accountability, Communication Skills and tagged accountability, communication on January 6, 2012 by Tom Foster.